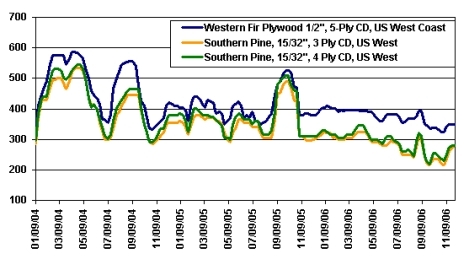 RISI publishes Crow's wood products price services, the longest-running source of prices in the North American lumber and panel industry. Crow's gives you objective wholesale pricing and detailed market reports designed to give you a quick but accurate understanding of each week's market. Crow's helps you make more accurate market decisions and ensure you're getting the best price. Providing quick, accurate analysis of each week's market, Crow's provides detailed market reports for all species and products. These news stories add depth and color to price reporting by filling in critical details about market movements. You get an understanding of key market drivers, from mill inventories to regional housing demand. A feature no other service can offer. From a table of current market prices, click on any price to instantly see a graph of the price for that item over the past two years. Click another price to see that item graphed and to instantly see the historical spreads between the two items. Plus, price history spreadsheets let you easily cut and paste prices into your own spreadsheets for analysis. The impact of public policy. This unique perspective comes from editors who have not only covered wood products markets, but have actually worked as traders in those markets.